Construction of the Duomo began in about the year 1150. The marble pavement inside was designed in 1517-1547 by Beccafumi. On the left altar there are early works by Michelangelo. In the left transept is the bronze St. John the Baptist by Donatello. Nicola Pisano's pulpit (1265) was created in the style of his famous pulpit in Pisa. The pillars are decorated by angels by Beccafumi. In the Cappella Chigi on the right are Bernini's late paintings of Mary Magdalen and St. Jerome. Duccio's stained glass masterpiece has been restored, and is now on exhibit in Siena's Santa Maria della Scala. The Pinacoteca Nazionale (State Picture Gallery) is situated in the Palazzo Buonsignori, an elegant building of the Siennese late-gothic style and was founded in 1700 when Abbot Giuseppe Ciaccheri gathered together a collection of paintings. Gradually, the collection was added to by private and public donations. The gallery has 38 rooms and boasts roughly 700 paintings, exhibited in chronological or stylistic order featuring Siennese masters such as Duccio di Buoninsegna, Simone Martini and Ambrogio and Pietro Lorenzetti. Ground floor: original carvings from the cathedral facade, including life-sized figures by Giovanni Pisano (1284-90) in the original workshop of the Cathedral. First floor: Sala di Duccio - Duccio's Maestà (1308-11), and on the left wall, predella scenes of the Passion, originally on the reverse side of the painting; right wall, a triptych by Pietro Lorenzetti and a Virgin and Child by Duccio. Follow signs upstairs in the back to the Panorama for a sensational view. The library was commissioned in 1492 by Cardinal Francesco Piccolomini Todeschini and was intended to house the extensive collection of books belonging to his uncle, Pope Pius II, and to honor his memory. The walls and the ceiling are entirely covered with frescoes whose colors are wonderfully preserved, with Pinturicchio frescoes (1502) illustrating the glorious events of the life of Enea Silvio Piccolomini, Pope Pius II. Rent a whole apartment in the country for less than the price of a smallish hotel room in a city. The Baptistery, also known as the Pieve di San Giovanni, was built between 1316 and 1325 and occupies a large space beneath the last two bays of the extended choir of the Cathedral. The marble façade was created between 1317 and 1382. In the centre, Jacopo della Quercia's marble font (1411-30) with bronze reliefs and sculptures by Ghiberti, the Baptism of Christ (facing the entrance) (1424-1427), Donatello's Feast of Herod, Faith and Hope and della Quercia's Annunciation to Zaccharias. This building is divided into two floors: the lower oratory, painted by the most famous siennese artists in the 15 C, and the upper oratory, with a lacunar ceiling and walls entirely painted with the History of the Virgin by Pacchia, Sodoma, Domenico Beccafumi in the 14 C. Next to the oratory, there is The Museo Diocesano di Arte Sacra, in which are preserved frescoes by Pietro and Ambrogio Lorenzetti and tables from the 14 C to the 16 C.
The Museo Civico is situated in the Palazzo Pubblico and has several rooms. Among the most important of these is the Sala del Mappamondo, which hosts Simone Martini's Maestà, the Sala della Pace and the Sala dei Nove, so called because it was the seat of the "governo dei nove" (the government of nine), decorated by a series of frescoes by Ambrogio Lorenzetti. Other important rooms include the Sala della Balia, the Sala dei Palestri and an exquisite chapel decorated with frescoes by Taddeo di Bartolo. Santa Maria della Scala was founded in the 12 C as a hospice. Its numerous rooms are now a museum. The most famous room is the Sala del Pellegrinaio, with its 15 C frescoes depicting the history and life of Santa Maria della Scala by Domenico Bartolo, with the collaboration of other artists, including Vecchietta. Among the smaller rooms of interest are the Sagrestia Vecchia, the Cappella delle Reliquie with the lunette by Domenico Beccafumi, the Cappella della Madonna and the Chiesa della SS.ma Annunziata. 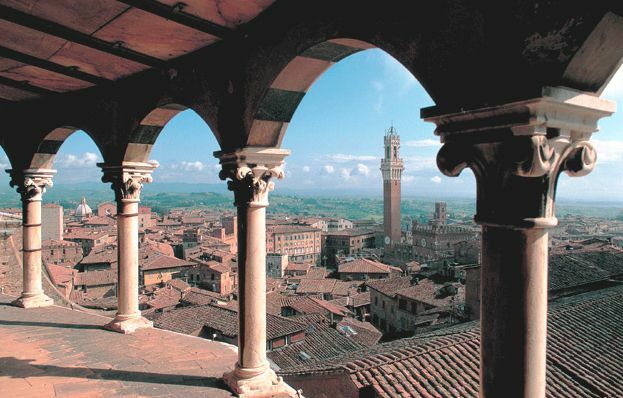 The Marcacci, Novaro and Stretta rooms host the Archaeological Museum of Sienna, which exhibits articles found mainly in the Sienna and Chiusi areas. Construction of the church of S. Agostino began in the second half of the 13 C, but work continued until the end of the 15 C. The interior was renovated in the 18 C by Vanvitelli as a result of the disastrous fire of 1747. The 16 C and 17 C altars in the nave and transept hold canvases by Siennese artists of the early 17 C, as well as a Crucifixion by Perugino. The Bichi chapel is particularly famous for the only known frescoes by Francesco di Giorgio and the Piccolonlini chapel with a fresco of the Maestà by Ambrogio Lorenzetti.